As I grew up, my obsession for straight hair also magnified. Yes… I was obsessed with straight hair. It is very easy to manage and there are wide varieties of hair styling options available. Ah! How I love it when the fringes kiss the cheek. How stylish it would be to casually (though rehearsed umpteen number of times) move those strands of hair away from face. Think about it… Straight hair makes anybody look better. i. Do you have pimples? You may hide them by leaving a few fringes on your cheeks. It would camouflage your flawed skin. ii. Do you have high forehead? You may cut hair on the front. iii. You don’t have any jewels that go with your traditional dress? Why don’t you leave your hair open? Nobody would notice that you are not wearing any danglers or chunky necklace. Wow! Some money saved there, isn’t it? iv. Ouch! Did you find out just now that you have forgotten to carry kajal with you? Or even worse, you open your gel kajal and realize that it is over? Don’t worry. You can let the fringes fall on your eyes. Now everybody will be so busy on evaluating your lustrous hair that they would not care to notice that your eye make-up is missing. v. You can save time! You don’t have to braid hair… choose matching ear-rings… You don’t even have to wear make-up! Straight hair… A wish that can never be fulfilled! But here I have a hair that is neither curly nor straight. It is so unmanageable that I have to braid it all the time. I am forced to use at least half a dozen of hair pins. I can never do a deep U cut… V cut or layered cut. Ho! Fringes remain as a distant dream! And on one of those bad hair days, (For me every day is!) 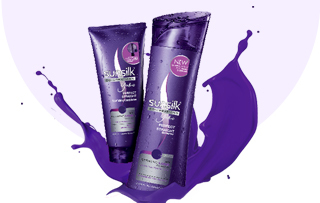 I came across this contest hosted by Sunsilk. I applied for the sample and waited for the same to arrive at my door step. And on the evening when I got it delivered. I opened it… The violet color reminded me of the color of poppins for which we fought for as kids… I opened it and the smell reminded me of some candy I had eaten during my childhood… The violet color looked unique… I was scared to experiment with a new shampoo. Not because I have a great hair. But because it is already too unmanageable Yet, I tried it on my hair… I first used the shampoo… And then, the conditioner. WOW! I am amazed. The hair seemed to have become soft and manageable. The waves of my hair looked more subtle. That evening, I went out with a pig tail. Yes. You read it right. For me even a pig tail is a great achievement. With a waist length unmanageable semi-curly hair, even that seemed to be a distant dream earlier. In short, I am super satisfied with the product. I don’t have any regrets. Who knows, on account of the shampoo I may fall in love with my hair and start flaunting it! I might even proudly say that I have a rare breed of hair called wavy hair. What say folks? Thank you Indiblogger and Sunsilk!